LONDON, GREATER LONDON, UK, November 8, 2018 /EINPresswire.com/ -- Nearly three-quarters of all environmental consultancies' (ECS) 2017 revenues were earned in North America and Europe, Environmental Consulting Services Global Opportunities and Strategies To 2021, as a new report from The Business Research Company shows, and these markets are continuing to grow as fast as or faster than the markets of Asia Pacific, South America, the Middle East and Africa. North America by itself accounts for over half the ECS industry's sales, while in both Eastern and Western Europe the markets are growing at twice the rate of any other region. ECS growth has, however, slowed in four regions out of seven - Eastern Europe, Western Europe, South America and the Middle East, but the fact that it has accelerated a tick in its biggest and third biggest markets of North America and Asia Pacific means that global growth has increased slightly. 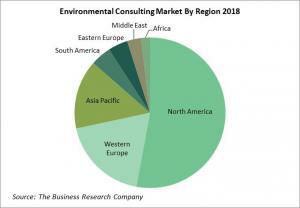 Data: Environmental consulting services market size and growth for 7 regions and 12 countries; global regional and country environmental consulting services market size and growth segmented by type of service; global regional and country environmental consulting services market size and growth segmented by end-user industry - mining, manufacturing and process industries, energy & utilities, governments and regulators, infrastructure % development, other end users ; global, regional and country environmental consulting services per capita consumption and market size as a percentage of GDP 2013-21; AECOM, Amec Foster Wheeler, Tetra Tech, Environmental Resources Management, ARCADIS, WSP Global, Stantec, SWECO, Cardno, RPS Group, ICF International, Ramboll financial performance 2013-21.